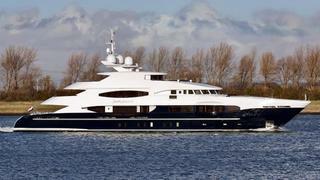 On 23 January we reported the arrival of the latest Heesen yacht on the Côte d'Azur. Called Serenity, this new Heesen 55 metre remained something of a mystery until today, when the Dutch yard shared more details, specifications and pictures. In the interior, designed by Frank Laupman of Omega Architects, various woods and marbles have been used to create a 'peaceful and harmonious atmosphere' enhanced by the decorative use of glass. Installed in the ceiling above the owner's bed, one such glasswork representing the sky and clouds was designed by Omega Architects and executed by Glass Déco artisans. Serenity's layout accommodates 12 guests in a full-beam master suite on the main deck, which has two large side balconies, a full-beam VIP cabin, two doubles and two twins on the lower deck. Among the yacht's other special features is an enclosed spa area complete with steam bath, sauna and massage room.